The Wall Street Journal had an article Evading the Constitution to Ban Nuclear Tests that discussed the Comprehensive Nuclear Test Ban Treaty (CTBT). The Obama administration is trying to make an end run around Congress to get the U.N. to make member states who are signatory and who have not ratified the treaty a party to it. Therefore making it illegal for the U.S. to test nuclear weapons. I am shocked and appalled that a sitting U.S. President would put the American people, as well as, the free nations of the world at risk by attempting this maneuver. We have not tested any nuclear devices since 1992. We have used simulations to "test" our upgrades to the current weapon systems. The DOD has noted that this is reaching the end of its usefulness. The more we depart from the original designs, the more unpredictable our simulations become. The nuclear umbrella that keeps Russia and China, but more importantly these days N. Korea and Iran at bay is Mutually Assured Destruction (MUD). Our allies have lived under the security of this umbrella, and they have not had to keep stockpiles because of the safety we provide. This has made the world a safer place. President Obama is attempting to usurp powers not given to him in the Constitution. The CTBT was rejected by the Senate in 1999 where sensible minds prevailed. 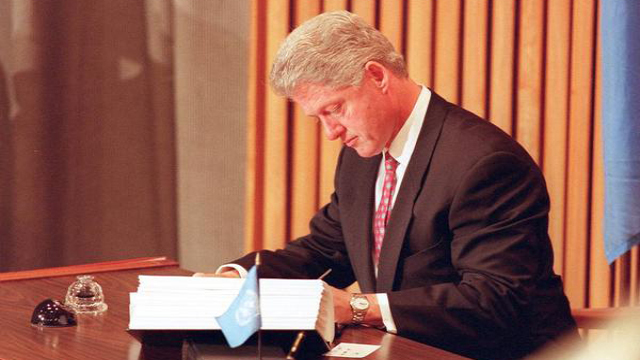 Let me remind everyone that the original treaty was signed by President Bill Clinton whose wife is now running for the same office. I am not trying to make a political statement other than note that if they have the same beliefs; it will put us at risk again to ratifying a crippling treaty that only benefits our adversaries who do not play by the rules; think Iran and Russia to start. Encourage your elected representatives, especially your Senators that this end run on the Constitution should be squarely put down, and reign in on Presidential power. I swore an oath to uphold and defend the Constitution against all enemies foreign and domestic. This applies equally to elected officials that attempt to subvert their clearly defined powers. Ask your Congressmen to do their jobs, and curb assumed Presidential powers.